On Wednesday night I had the pleasure of seeing DAD at The Studio at The Blue Room Theatre, where I had a whole hour to appreciate and think about my dad. Even more than that, there is something so funny about seeing three grown men building pillow forts in matching grey onesies. DAD is an interactive storytelling theatre piece that is both hilarious and thought-provoking. 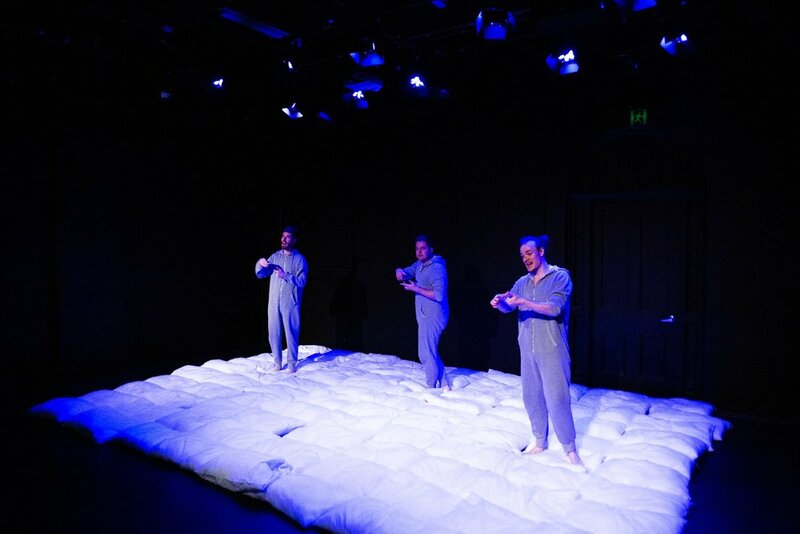 Sweating through their overalls in the 37ºC heat, three of Perth’s emerging theatre-makers, Isaac Powell, Jarryd Prain and Marshall Stay explore the shifting nature of one’s relationships with their father, masculinity, connection and legacy in a hilarious and deeply personal experience. Never before have I seen such a perfect mixture of humour and emotions. I was laughing one minute and tearing up the next. The interactive elements of this piece of theatre was the cherry on top; it was an open invitation to the audience’s inner child answering questions you never want to think about again. The uses of pillows as props were innovative and creative; not only were they being hurled across the room, but they were also piled like a mountain and at times, transformed into pizza slices. They even served as a projection screen that mesmerisingly and effortlessly transformed the black box theatre. Truly, DAD is a hilarious, fluffy and heartwarming piece of theatre that needs to be seen if you are looking for a good laugh or cry. It’s a chance to reflect on the memories and events that shape who we may see as the father figures in our lives. Think memories like that time he taught you how to ride a bike, or the countless hours he blasted his favourite ‘dad rock’ albums… You’ll be wanting to call your dad straight after or giving him a big deserving hug. Feb 11 FRINGE REVIEW: "Velma Celli's: A Brief History Of Drag"